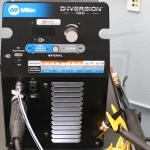 Do you want to take your Miller Diversion 165™ / 180™ and Hobart EZ-TIG 165i™ TIG welding machine's performance to the next level? Arc-Zone makes it easy for you to upgrade your entry level machine to out-perform anything in its class without dropping major coin on a new industrial grade power source! 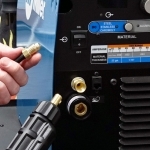 The JW Signature Series™ Welding Machine Upgrade Kits are engineered to maximize your welding machine's performance, while giving you the ability to choose the perfect TIG torch and accessories for your welding projects. 1. Torch Update Kit - Thread-on popular 12.5' (3.7m) or 25' (7.6m) Air-Cooled TIG Torch for improved comfort, performance and application versatility. 2. 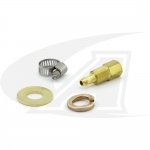 Torch/Work-Lead Update Kit - Twist-lock female Dinse panel receptacles allow you to connect popular Air / Water-Cooled TIG Torches and Work-Lead (ground) just like the more expensive Dynasty machines. 3. Internal Gas Supply Update Kit - Replace the cheap plastic gas solenoid and porous rubber hose with state-of-the-art parts that save gas and reduce atmosphere contamination! No matter what kit, or combination of kits you choose, we feel confident based on experience in our shop, and from customers just like you, that you can benefit from improved performance and application versatility-- or your money back!